Band mates JIM ASHWORTH and BRYAN FREEZE formed Dr. Wu’ in 2002 after growing up and playing in various bands starting in the late 60’s. The name was taken from a favorite Steely Dan song that encourages us to live life to the fullest and strive to be the very best that we can be. With this as their goal, they set out to record their “Texas Blues” Project Volume I “Fort Worth Artists”… a long overdue recorded history utilizing guest appearances by musicians who have made Fort Worth a global mecca of top players… especially great “guitar slingers”. The first being BUDDY WHITTINGTON , a multi-talented guitarist and singer with an endless bag of guitar licks, sounds, and tricks that are always refreshing and are inspiring. Buddy is a permanent member of blues legend, John Mayall’s BLUESBREAKERS band. Buddy lends his talent to three tracks on the CD, including a live version of the popular Gary Nicholson song… “JACKSBORO HIGHWAY” an infamous strip on the Northside of Fort Worth which in the 50’s and 60’s was lined with nightclubs like THE SKYLINER BALLROOM where under aged teens could get in to see their blues heroes like Jimmy Reed, Ray Sharpe, Delbert McClinton and countless others on any given Saturday night. After a chance meeting at The 6th Street Bar & Grill, a local Fort Worth blues venue, long time friend STEPHEN BRUTON instantly agreed to add his creativity to a track. Stephen, a “star” in his own rite, has been a player early on with the likes of Kris Kristofferson, Delbert McClinton, Bonnie Raitt, and countless other greats. Home-grown JAMES PENNEBAKER added his tracks from his home studio in Nashville due to his busy schedule and much sought after talent as a guitar, fiddle, and pedal steel master. James has been a member of the Delbert McClinton, Leroy Parnell and more recently….Big & Rich bands. James is now the Artist Representative for FENDER GUITARS, NASHVILLE. “Red” is currently on the road with Eric Burden and the “Animals” and has also toured with Linda Rondstadt, Sonny and Cher, Joan Armatrading, Tanya Tucker, Delbert, and is the front man for his own band, the ever popular.... RED and the RED HOTS. 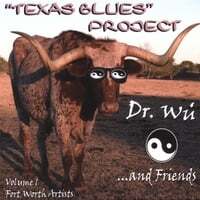 third member of DR. WU' after it was apparent that he was the "voice" that was needed to give the "TEXAS BLUES" PROJECT that special magic that would push the project to new levels of "BLUESDOM". DANNY HUBBARD on guitar, and GRAMMY nominated bassist, JERRY HANCOCK ...collectively the popular FORT WORTH group, "THE SIDEMEN." "MOUSE MAYES" guitarist for BLACK OAK ARKANSAS and POINT BLANK in the 80's and later THE VOODOO KINGS...more recently teams up with BUDDY WHITTINGTON when not on tour with JOHN MAYALL. BOBBY COUNTS…..Fort Worth’s “OFFICIAL BLUES AMBASSADOR” and bassist extraordinaire contributes on two tracks and…..
MICHAEL HAMILTON grooves on the keyboards along with THE SIDEMEN on “JACKSBORO HIGHWAY"
...and Last but not least….. “THE WORLDS GREATEST BLUES HARMONICA PLAYER", GARY GRAMMER plays on three..
Quite the collection of “World Class Musicians” to come from FORT WORTH and be featured on the first Volume of “TEXAS BLUES” PROJECT ! a genuine example of the soul these guys have to give learned from the r&b masters v.i.b. Still enjoying and looking forward to more. London House Blues?? Great blues album, good Texas Blues sound. Best new blues in ages!!! Good time music at its best. Nice going "Dr Wu"
The sound is crisp and the lyrics are tight. The Blues are about the stories and the rhythm, this CD blends them perfectly. Get some more of this.